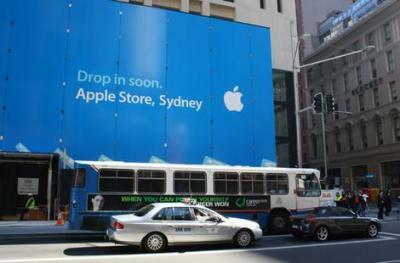 Sydney Morning Herald reports that Apple has posted a teaser sign at the location of the first Apple Store in Australia. The sign reads "Drop in soon. Apple Store, Sydney". Located at 77 King Street, the three story building is expected to have about 1335 square meters of floor space. While no official launch date has been announced, rumors point to June 19th at 6pm as the opening date. According to SMH, this is the first Apple Store to be located in the southern hemisphere. Two other Apple Stores are expected to follow: one in Melbourne, and another in Sydney.